A man is hospitalized with serious health concerns. But, his condition is stable and caregiving staff convince his wife, who has spent long hours at his bedside, to go home and get some much needed rest. A day later, she returns to her husband’s room only to find that he is not there. Immediately, she assumes the worst: He has died and she never had the chance to say goodbye. Then, as if to confirm her worst suspicion, the patient’s wife consults a large, white electronic board in the room. Her husband is not dead, she learns. He is in radiology. They and other hospitals in the division are equipped with integrated MyCare boards, electronic dashboards that pull from patient records and display information pertaining to diet, tests and caregivers. The Hospitals of the Future additionally are employing “Real Time Locating” software. The MyCare boards have been installed in in-patient rooms and in ER intake rooms. They have produced anecdotes including the one involving a patient and his momentarily distressed wife. For Mark Robinson, until recently the CEO at Capital Regional, the boards are “communication devices that relieve anxiety for patients” because they are kept better informed. In March, Robinson departed Tallahassee to become the CEO at HCA’s hospital in Salt Lake City. There, MyCare boards have yet to be installed, meaning that conventional dry-erase boards remain in place. In Tallahassee, Robinson appreciated being able to walk into a room and, at a glance, satisfy himself that a patient had been seen at prescribed intervals and that his pain was being assessed properly. The board displays names of the three hospital employees who last visited a given room and when. Indeed, when a hospital employee wearing an interactive Smart Badge stops by a room, his or her name and title are displayed on the MyCare board. Some patients may have been flattered or surprised to look up and find that the CEO was taking an interest in their case. The boards are sophisticated enough that patients are introduced to them via an orientation session upon admission. “The boards connect directly to our charting system so that when a nurse begins her shift and logs into a patient record, we don’t have to manually populate anything,” Robinson said. From time to time, a nurse used to the way things were before the future arrived may turn to a patient and say, “Let me go see about the results of your CT scan.” It is the patient who then may remind her that the update she is seeking is on display on the MyCare board. Robinson summarized the “Hospital of the Future” effort as one aimed at better care, more efficient care, timely communication, improved asset management and inventory control and, as a byproduct, cost savings. Robinson said the Florida hospitals involved in trying on the technologies were not merely commanded to implement the new developments. Rather, he said, HCA wanted feedback from users in live settings so that they could better decide whether to install MyCare Boards and other products of the “Hospital of the Future” campaign in its 178 hospitals across the country. The advancements, Robinson stressed, were substantially pioneered within HCA’s IT departments. “It’s not like we simply purchased proprietary software from others,” he said. Erica Williams, the director of operations for HCA’s North Florida Division, said real-time locating capabilities are central to the Hospital of the Future program. Documentation equals delays, she said, adding “anytime we can make the workflows or our clinicians more efficient, we are helping them spend more time with their patients and contributing to better patient outcomes. “Data is useless without context,” Williams said, “so we have developed applications that make the data meaningful.” Raw, real-time locating data is then employed, for example, in the management of crash carts and other assets. Why were Capital Regional and Gulf Coast Regional Medical Center among the test sites? Proximity to one of HCA’s two group presidents was surely a factor, Robinson allowed. Chuck Hall, who oversees roughly half of HCA’s hospitals, lives in Tallahassee. iMobile is a clinical communication platform driven by smartphone technology. It provides for secure texting and Wi-Fi calling and displays information including nurse assignments, patient demographics and the results of lab tests. 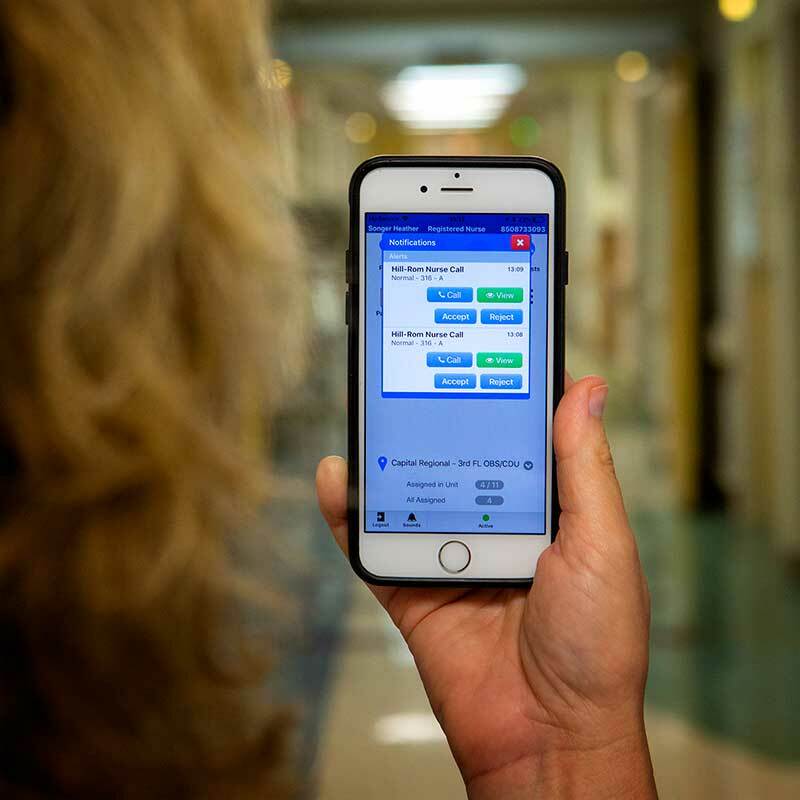 Advanced Nurse Call employs iMobile wireless integration to route and speed up patient calls, which are received by the nurse assigned to a patient versus being routed through an intermediary central nursing station. An InSites Locate App, also designed for use on iMobile devices, displays the location of tagged pieces of equipment including wheelchairs and IV pumps so that they can be swiftly found by the caregivers needing them. Robinson detailed a few of the applications of the iMobile platform. “If I’m a patient and I hit the button because I need help, maybe I need to go to the bathroom, the call doesn’t go to the desk anymore; it’s going to the nurse’s phone,” Robinson said. “You are getting that nurse immediately. “As the CEO, I had iMobile on my phone and, in the event of an emergency, I could broadcast a message to everyone who was logged into the platform. We had a Code White — an unruly person was inside the hospital — and we wanted to secure all of our entrances and exits. “We have tagged all assets valued at $700 or more: wheelchairs, beds, stretchers, IV pumps,” Robinson began. Surely, there is a way that the locator technology could be applied to luggage carts in hotels. The technology also lends itself to infection control. A hand hygiene monitoring application has been piloted exclusively at Gulf Coast Regional Medical Center in Panama City. Gulf Coast CEO Brad Griffin explained that interaction between the smart badges worn by staff and monitors in patient rooms and on hand sanitizer dispensers enable the system to know whether hand sanitizing is occurring when a particular staffer enters a room and again when he or she exits. Griffin said. In such a way, he said, the hospital encourages a positive outlook on the technology versus aperception that it equates to Big Brother invasiveness. In a hospital setting, “improved outcomes” may, of course, mean saved lives. Williams noted an incident involving a nurse who passed by a room and noticed that a patient not assigned to her was positioned at an unnatural angle in his bed. Closer examination revealed that he may have sustained a stroke. In addressing such a case, knowledge of the time of the last known “well” can be critical in determining which protocols to observe and medications to administer. At Capital Regional, arriving at that datum couldn’t have been much simpler. It was right there on the MyCare board.